2011 saw a big resurgence of energy in SICA (Subud International Cultural Association), our “cultural wing”, under the chairmanship of Latifah Taormina. Latifah is an extremely interesting person and one day I hope to add her to the list of people with whom I have done in-depth interviews. We received two really interesting stories about artists this year, both named Emily, although one is really called Emilie, since she is French (how few articles we get about that wonderful country!) Thank you very much Lynnelle Stewart, one of our most loyal supporters, for telling us about Emily. I paint in watercolour and mixed media and enjoy the way that texture and the relationship of shapes and colours can relate to each other to transform the ordinary into the extraordinary. I like Cecil Collins definition of art as “a marriage between the known and the unknown” and for me this includes the spiritual. Other artists who have influence may have been Samuel Palmer, Chagall, Delaunay, Kandinsky, Klée and Macke. I've had four solo exhibitions in Watford, two at Watford Grammar School for Girls, one at Watford Museum and one at the Newton Price Centre. I have also shown work at Croxley Green Library in aid of the New Hope Trust, exhibited with Rickmansworth art society, Watford and Bushey Art Society, Watford Arts Forum, local U3A Groups and the Pump House. For a while I attended classes at “Drum” which I found most inspirational. At the moment I enjoy going to be Art resource Group at the Pump House where we paint together and share ideas and learning from each other. We all paint in different styles and I find that stimulating. In the past I have enjoyed running “Mandala” workshops. These are circular paintings which can be found in many religious and spiritual traditions. Jung also used them for therapy. The circle has always been very symbolic. It represents a safe space where people can meet together in harmony and support each other. It symbolises a journey through life where we return to the place we came from. It represents the light of the sun and the wonder of the moon. In a circle we are free to express our individuality but can feel held by a power greater than ourselves. I hope that in a small way all my paintings can celebrate the presence of God in the world. Today we are bombarded with bad news, violent images and we live in a culture which worships material success and tells our children that usually there can only be one winner. For the rest, failure and probably humiliation. No wonder they resort to drugs or violence. I believe that the arts can provide an antidote to this and that it is important we nurture ourselves and each other by using a creativity in a diverse and non-competitive way. This is especially important in a multicultural society where we need to respect and understand each other. I hope that you find something that speaks to you in this exhibition. Art is for sharing. The money is going to Watford and the Three Rivers Refugee Project. This does marvellous work and is purely voluntary. Emilie Pez is a teacher at Bina Cita Utama school in in Central Kalimantan. She's originally from Toulouse in France. She teaches French and Art and she is also the coordinator of the volunteers who come to the school. I know that in her role as coordinator, she was extremely kind and helpful to me during my time at the school. In both personal and practical ways, she went out of her way to make me feel at home. She is an artist, and her extremely sensitive nature is expressed in exquisite acrylics. 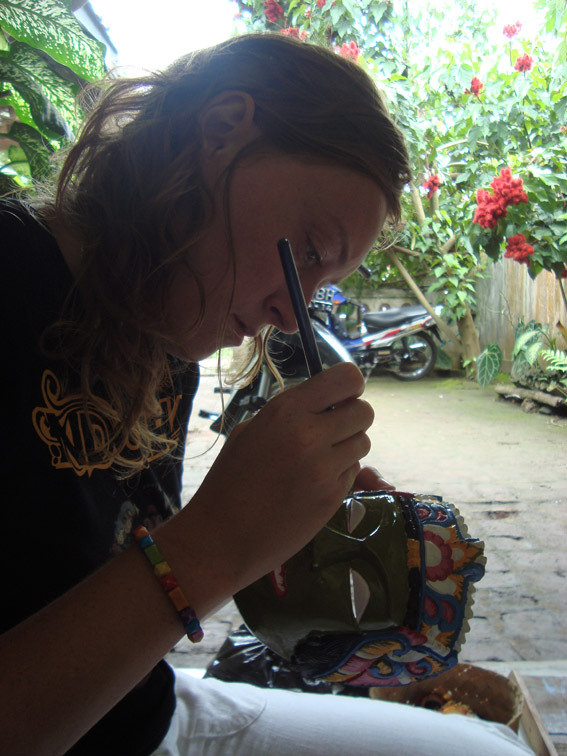 As well as that, she has learned to make Javanese masks carved from wood in the traditional style. Before I joined Subud, I went to Bali with the idea that I was going to immerse myself in Balinese culture and life and learn the Balinese arts of music, dance and so on. I did not do this half so well as Emilie has done, in having accessed the rich Javanese cultural traditions that go back thousands of years. As part of her journey, Emilie has got to know some Tengah people.These are people who live on the remote mountains and plateaux of Java, untouched by Islam, and who have preserved in their pure form the spiritual and artistic practices which go back to the very roots of the "religion of Java". Through an Indonesian teacher at the BCU school, she was welcomed into an artists' colony near Malang in East Java. This is a place where many traditional artists come to practice their art and other people come to learn from them. After a time there, Emily was encouraged to make the masks. This is not just an art form, it has deep spiritual roots, and not just anyone can do it. You actually have to be at the right stage of life to be able to begin to practice the arts and it is often surrounded by ceremony and ritual. 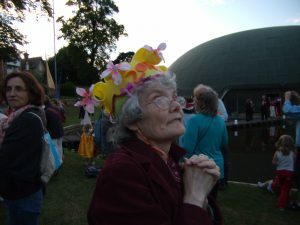 Often, for example, your own inner nature may be attuned to making a particular kind of mask. There is a pantheon of characters from Hindu- Javanese history, myth and legend and you may be attuned to making masks of a particular character. In Emilie's case it was recognized that she was inwardly attuned to a character called Dewi Kili Suci. This character seems originally to have been an historical person, a princess who lived around 1035 in the kingdom of the well-known figure, King Airlangga. Dewi Kili Suci rejected marriage and instead went to meditate by herself in a cave in order to develop her spiritual nature. It is believed that she continues to exist as a spiritual presence.People go to this cave to experience Dewi Kili Suci. It seems that Emilie was able to find that balance within herself between the latihan and her exploration of Javanese culture, and she has produced several beautiful masks of Dewi Kili Suci. Emilie has also learned Javanese dance.